Last year I was in the Hamptons on Fourth of July which was a lot of fun! You can read the post here. This year I am throwing a small BBQ at House of Squirrels headquarters! What’s on the menu? I am going classic this year: Cheeseburgers, baked beans and a fresh arugula salad. For starters we will serve crudites, chips, guacamole and salsa. I will offer Sauvignon Blanc (the only Summer wine you should be drinking), seltzer water (for non-drinkers) and House of Squirrels famous margaritas! The recipe for my Margs you can find here. Below are some Squirrel secrets! Burgers: Make sure you buy premium beef. I buy my meat either at Whole Foods or Bristol Farms( no hormones and organic). The day of BBQ take your meat out and form into patties. Sprinkle Fleur de Sel, ground black pepper, cayenne pepper and drizzle with olive oil. Cover patties and place in refrigerator. An hour before you are ready to grill them take them out for an hour before and allow them to come to room temperature. This allows the meat to cook evenly! To purchase Fleur de Sel (french salt) Shop Squirrel offers it here. Baked Beans: Purchase two large cans of Busch Baked Beans, original recipe. One jar of Pace Picante Salsa. The day of bbq empty both cans into large baking dish. Pour in the entire jar of salsa. Mix up and place in refrigerator until you are ready to bake. This allows the flavors to meld. Turn oven to 350-400 (depends on oven) and bake for at least two hours. 30 minutes before, take them out and get a bag of potato chips and crunch them all over for a crispy crust. Place back in oven for remainder 30 minutes. The salty sweet really works on this dish! I saw this idea on Pinterest and loved it! 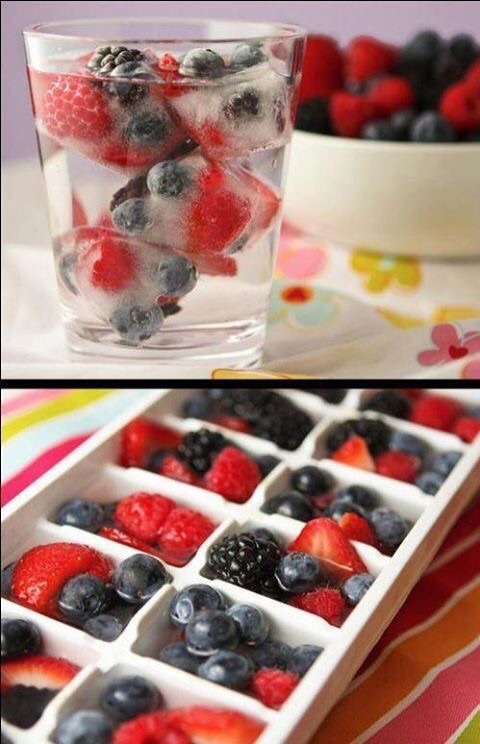 Take fresh berries and place in ice cubes trays and then fill with water. Take out when frozen and use as ice cubes! 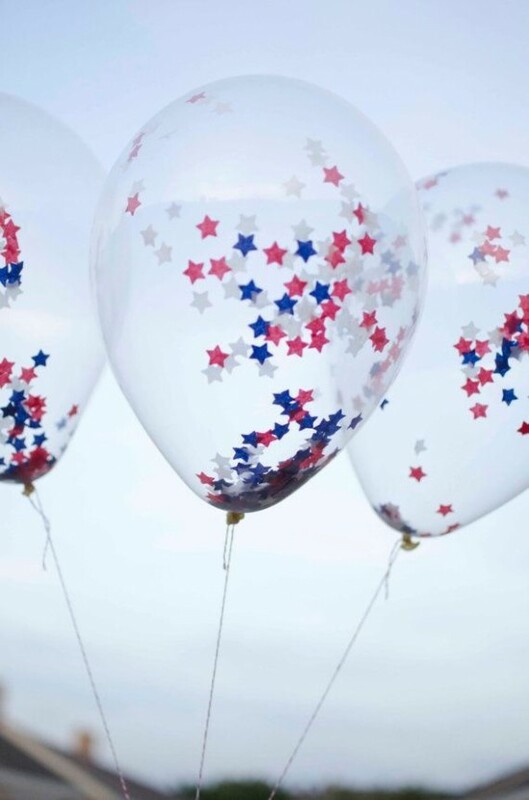 Brilliant idea, which I am totally doing for the Fourth! 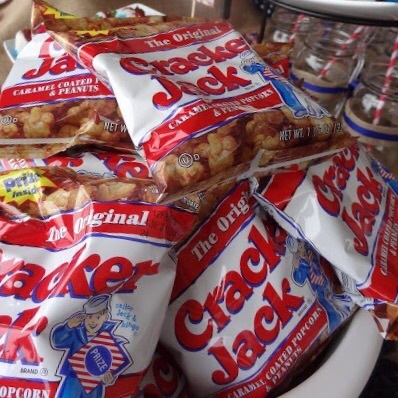 Dessert: I am doing an all American treat- Cracker Jacks!! Your guests can take a bag to go or eat there. There is something that screams America in Cracker Jacks! The only thing is I am having a hard time finding them! If you want to do a berry dessert check out my recipe for my ‘Whipped Berries and Cream’ dessert. Click here. Hope everyone has a safe and wonder Fourth of July! !